or culinary services, restaurants, hotels, catering service etc. transferable visa will be considered. Writing Arabic and English language. for Polyclinic with licence or evaluation. Safety Ofguce -02 NEBOSH Certified with 2 yrs experience. 2 yrs of experience Electronic. Life Guard- Certified Life Guard with 2 yrs of experience. 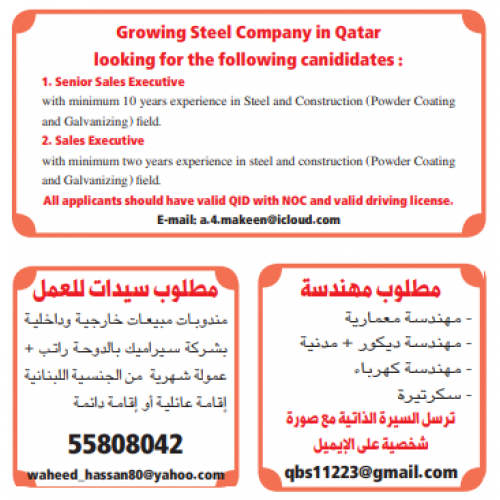 female) required for contracting and transportation co.
specialist) Civil engineer (project manager) Civil QA/QC. the below. Mail ID: arshshaikhz96@gmail.com / 33731445.